The POWERplus Zebra is a high quality solar powered powerbank with an internal battery of 2.000 mAh. 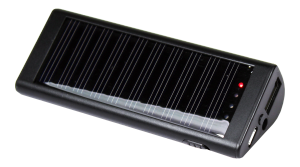 The Zebra has an integrated 0.3W solar cell, but offcourse this powerbank can also be charged by USB. Includes charging and battery status indicators. A USB charging cable with micro USB, lightning (Iphone 5 / 6) and Iphone 4 adapter tips is included.